If you’ve always had a fascination with the Roman Empire and wanted to experience life as a warrior now is your opportunity as you join a band of Spartan brothers to enter the battlefield and fend of enemies who are intent on taking over the territory. The Victorious slot machine has been developed by Net Entertainment and has been designed in a comic book style with beautifully illustrated graphics. On both sides of the reels you will see a swarm of armour-wearing, sword clutching warriors who are marching into battle with the beating sounds of drums ringing out which will have your heart beating in anticipation of the blood battle that awaits, with flag bearers holding the SPQR sign aloft, which means The Senate and the Roman People. Victorious is a 5-reeled video slot which offers 243-ways to win with you having to pay dues of 25p up to £125 to go to war with the warriors. Boasting an impressive return to player percentage of 96.90%, you’ll enjoy Wild wins when Golden Eagles appear, Scatter pays that are worth up to 50x your stake, plus there is a free spins feature where you could receive up to 25 spins with all wins tripled – which never fails to see you claim victory! The symbol of power and strength in Ancient Rome was the eagle and you’ll notice Golden Eagles being proudly displayed by an eagle-bearer as you join your fellow warriors to march into battle. These are the Wild symbols in Victorious and, such is the power that these have, they can substitute for any other symbol aside from the Scatter, plus whenever they are part of a winning combination you’ll witness the head of the eagle rapidly rotate as a basic animation occurs. The Scatter symbol is another famous icon of the period of the Roman Empire as it is represented by a Laurel Wreath. These were reserved for special people such as the Roman Emperor so you should feel fortunate whenever they appear on the reels, especially if you land three or more as this means you will get the honour of spinning the reels without charge! Most valuable of all on the reels is Julius Caesar with his appearance on a payline five times resulting in a win worth 1,500 coins, plus you’ll also see a Centurion who has been trusted with leading the band of warriors to victory on the battlefield, an armoured warrior who is wielding his sword down to slay an enemy, and a view of the clan marching onto the battlefield, along with low valued Ace to 9 symbols. In addition to your armour, sword and shield, you could also find yourself in the middle of the battlefield armed with free spins to do as much damage as possible whenever you land three or more of the Laurel Wreaths (Scatter symbol) on the reels at once. While the instant Scatter wins along with your number of free spins always results in you claiming a big victory, the fact that all wins are subject to a 3x multiplier bonus and the fact that you can re-trigger additional free spins never fails to see you scream ‘Victorious’ each and every time! While we have reviewed countless online slots based on the Roman Empire with the likes of the Roman Chariots slot machine and the Spartacus Gladiator of Rome slot machine which have both been developed by WMS it’s a theme which always proves popular amongst player’s time and time again. 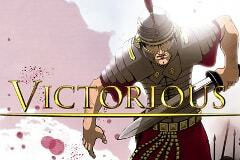 While the Victorious slot machine has a brilliant design in the style of a comic with dramatic sounds of drums beating as you prepare for a blood battle on the battlefield, it certainly lacks substance with only a free spins bonus feature included, although it is extremely rewarding so this does make up for it – and it never fails to see you claim victory with big wins!